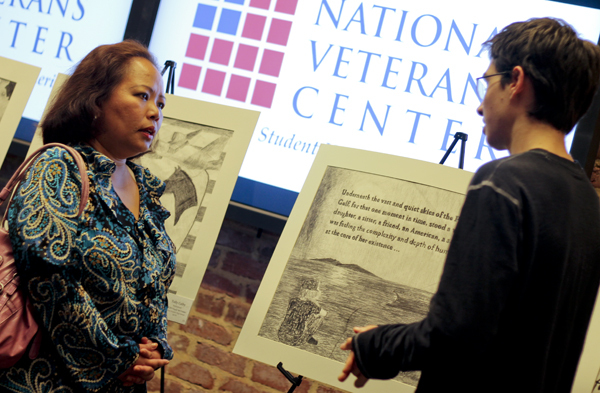 Alumnus and veteran Melanie Alvarez listens to a Maryland high school student Max Maynard discuss the artwork he created to depict her military service. Derek Regier had never met the artist who depicted his time in the Marine Corps with a charcoal drawing. But as he walked into the National Veterans Center Monday and looked at the series of drawings, he immediately knew which was his. It showed a marine in the stages of a military transformation: rigorous training, deployment in Afghanistan, working long hours at a desk and finally returning home. “I was speechless at first. The detail on it is just incredible,” Regier said. Regier was one of 25 veterans who saw their words transformed into images, ranging from the human connections they made in the military to the trauma of war. Michael Ruybal, the associate director of the Office of Military and Veterans Services, said he hoped the project would help civilians better understand the veterans’ experience. “It’s one thing that I can sit and tell you my military history until I’m blue in the face, but when you put a visual image to that – something that you can actually resonate with – there’s something that’s going to stick out to you about being a veteran, what they go through, what they’ve experienced and where they are now,” he said. Ruybal added that the event was also an opportunity for student veterans who have graduated to reconnect with campus. Melanie Alvarez, who graduated from the Graduate School of Political Management last spring, returned to GW to see the drawing of herself created by 15-year-old Max Maynard. In the drawing, a female soldier sits on a beach along the Persian Gulf, “feeling the complexity and depth of human history at the core of her existence,” the artist wrote across the top. Alvarez said she worried that a high school student might not understand or be able to relate to her military experiences, but was shocked when she first spotted the drawing at how well the artist was able to relate to her experience and accurately portray it.